For those of you out there who aren’t familiar with the subject, a composting toilet is a self-contained unit that breaks down and dehydrates human waste to a compost. This type of toilet isn’t connected to a septic or sewer system. You may add the compost to soils afterwards. A composting toilet includes a place to sit (that may look like any other toilet), a composting chamber that breaks down the sewage, sanitizing it as well and a drying chamber or tray. This part allows moisture to go, minimizing the sewage volume. The market gives you many models of composting toilets, some using water, some not using water at all. You may also find electric (heated or power-vented) and non-electric types also. You may also get one that comes with electro-mechanical mixer that mixes waste using a mulch product, improving and speeding the composting process. There are composting toilets that don’t mix new human waste with already composted material and they typically feature several containers/compartments. It’s essential to design and install right the composting toilet so that is efficiently vented, with minimal abnormal toilet odors. You must empty the compost from time to time and to also clean the toilet components. Depending on how often you use the toilet and its design, you should empty it from one/two months up to every 12 months. When a visible part needs cleaning, a regular toilet brush should work for the job. 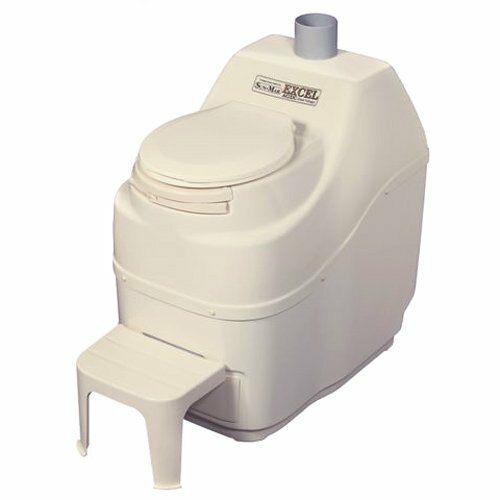 A composting toilet nowadays doesn’t have an unusual appearance and it looks a lot like a water-base toilet. If you’re planning to install a composting toilet, it’s essential to know where you’re gonna install it and how often you’re going to use it. Give a thought on the features you want and the regulations you need to have for installing it. Even though it’s a safe option, you do need to follow some health regulations. 1). 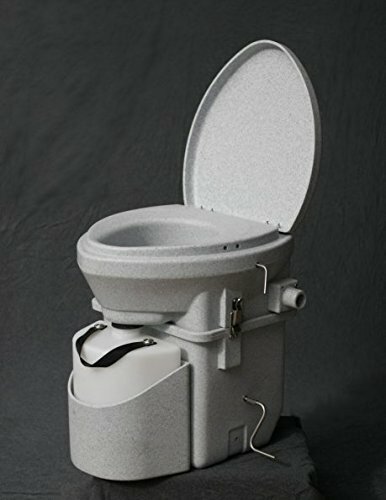 Proudly made in our USA, the Nature’s Head Self Contained Composting Toilet with Close Quarters Spider Handle Design isn’t just easy to install, but also dependable and comfortable. The toilet presents an all-stainless hardware design and has a small footprint, which is always a good thing. It’s a bit taller than a regular toilet and it’s very comfortable to sit on. You may mount it close to the wall, very easy, by the way. The seat is full size elongated explains the comfort. The toilet features efficient vent hose and fan which explains the minimal smell. Its design allows you to dissemble it fast and easy for emptying it. The toilet is highly versatile and you may take it in a marine environment or anywhere you need it: RVs or campers, barns, yurts, workshops, and even trucks. The low volume air circulation is built into the head, recycling the air in the bathroom, for a better smell. The toilet was originally designed for marine use, which explains its durable construction. The battery lasts for long and you don’t need water for the toilet. All in all, as long as you’re determined to get a composting toilet, you shouldn’t hesitate to give this one a try. 2). 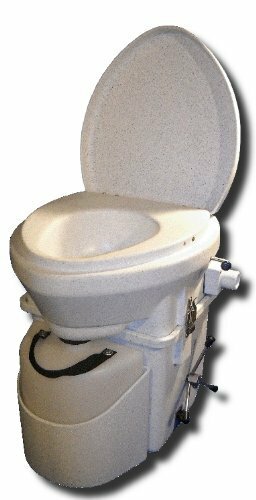 Easy to install and to use, the Nature’s Head Composting Toilet with Spider Handle is a great option for 2 people using it on regular basics. Its capacity is good and you only need to empty it every 4 to 6 weeks. The toilet has a better design than previous models and even though may seem very simple to some, it’s also very efficient. The good build of the toilet recommends it for the marine or RV sanitation. It’s also a dependable choice for a small cottage or a guest room. It takes around 60-80 uses which means two people wouldn’t have to empty it for a whole summer. The foot print isn’t large and the toilet is space consuming. You don’t need to worry about plumbing. The toilet turns human waste into organic compost and not raw sewage. It’s 100% non-polluting and safe for your health. It’s wired for 12 volts, but you may get a wall adapter and other accessories for more versatility. The vent fan on the toilet is quite efficient and there is no smell. It has a good size and it comes with everything you need for using it. Regardless the minor issues, for the efficiency and good capacity, the toilet is a great choice for two people, for sure. 3). The low profile of the Sun-Mar Excel Non-Electric Self-Contained Composting Toilet, Model# Excel-NE is one of the things we like the most on this composting toilet, but there are many things that we really like about it. The composting toilet is a non-electric model, which makes it very appropriate for various applications off the grid. The low profile makes it easy for anyone to use it with no worries about not complementing a specific room. The toilet doesn’t use any water so it’s great for anyone who’s worried about low costs. It comes with a variable diameter bid-drum with a recessed handle that you get to use when processing compost. The smell of the unit is minor and the toilet is pretty efficient when it comes to converting human waste into safe fertilizing soil. The bacterial balance in the unit works, minimizing bad odor. The model has a medium to high capacity use, which makes it a good option for a family with 2-3 people. It can also serve very well as a cabin for a weekend for 5-7 people. The toilet comes with a venting kit and it’s not very complicated to set it up. Some say this is quite a foolproof unit. The composting toilet is 100% non-polluting and a healthy option when you don’t want any plumbing around the house. 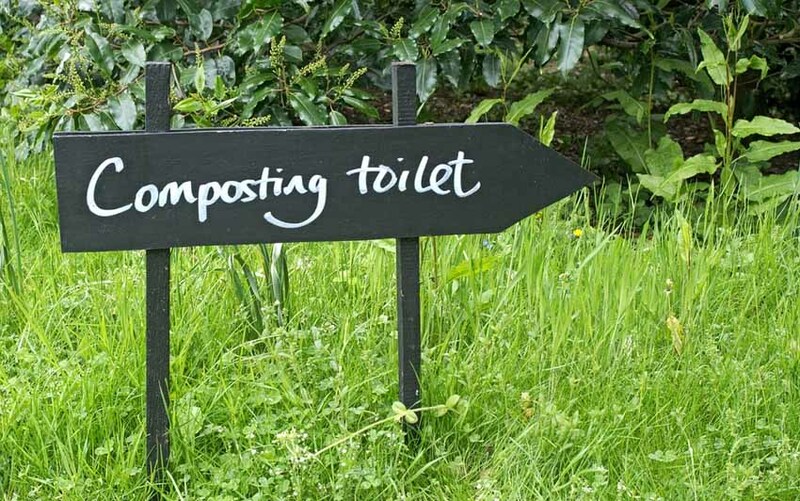 Despite the minor issues, for the low profile and non-polluting ability, the composting toilet is a great choice to consider when going green. Getting a composting toilet that also looks nice shouldn’t be so challenging, but it seems that looks are on last place when it comes to the designers of this type of toilets. 4). The Sun-Mar Compact Self-Contained Composting Toilet, Model# Compact makes a nice impression not only with its efficiency, but also with its looks, as it doesn’t look bad no matter where you put it. The low profile fits any bathroom, improving its overall appearance. The toilet is 100% non-polluting and doesn’t use any water. It comes with a variable diameter bio-drum with recessed handle that is functional for processing compost. The design is efficient and the toilet is self-contained and electric. It’s pest proof and also includes an emergency drain. As for health concerns, you should know it’s NSF/ANSI certified. The smell is minor and the toilet runs on standard household current. Despite the minor problems, the composting still is a good option for a single person in a residential setting. 5). 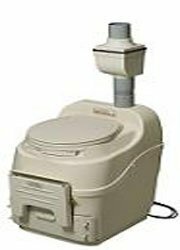 When you’re not looking for a composting toilet for your residential setting, but for your boat or RV, a dependable composting option is theSun-Mar Corp CSAS-01500B Mobile Electric Waterless Self Contained Composting Toilet for Mobile Applications in Bone. 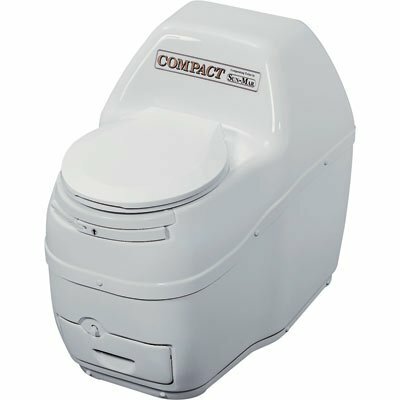 Especially designed and engineered to accommodate motion, the composting toilet is dependable and has a medium capacity. It may be enough for a family of four on a holiday. Even though it’s design is rather simple, the toilet is very efficient. It’s made with good quality materials and is built to last for quite some time. The design of the toilet is well thought-out, minimizing the need for pump outs. The toilet is great for motion as it comes with sturdy and tough mounting brackets. The drawer has a sealed finishing and the toilet includes a fold-up footrest. Therefore, the toilet doesn’t take much space either and it’s easy to fit in a small bathroom. It’s also pretty easy to install. It comes with an air filtration kit so the deck is odor-free. The seat has a good design and it’s quite comfortable. Durable and simple, the toilet is an option for anyone owning a boat or an RV. All in all, for the efficiency and simple design, the toilet still stands as a good option when you have a boat/RV.